An Introduction to Parallel Programming is the first undergraduate text to directly address compiling and running parallel programs on the new multi-core and cluster architecture. It explains how to design, debug, and evaluate the performance of distributed and shared-memory programs. The author Peter Pacheco uses a tutorial approach to show students how to develop effective parallel programs with MPI, Pthreads, and OpenMP, starting with small programming examples and building progressively to more challenging ones. 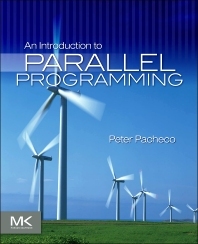 The text is written for students in undergraduate parallel programming or parallel computing courses designed for the computer science major or as a service course to other departments; professionals with no background in parallel computing. 1.4 How Do We Write Parallel Programs? Peter Pacheco received a PhD in mathematics from Florida State University. After completing graduate school, he became one of the first professors in UCLA’s “Program in Computing,” which teaches basic computer science to students at the College of Letters and Sciences there. Since leaving UCLA, he has been on the faculty of the University of San Francisco. At USF Peter has served as chair of the computer science department and is currently chair of the mathematics department. His research is in parallel scientific computing. He has worked on the development of parallel software for circuit simulation, speech recognition, and the simulation of large networks of biologically accurate neurons. Peter has been teaching parallel computing at both the undergraduate and graduate levels for nearly twenty years. He is the author of Parallel Programming with MPI, published by Morgan Kaufmann Publishers.